A wildlife orphan is an animal whose parent is either deceased or one that has been permanently separated from its parents. Regrettably, most babies that are brought to animal shelters aren’t naturally orphaned but inadvertently become so because of the intervention of well-intentioned people. Common human perception associates a baby animal with a “home”, for example, a chick with a nest, a pup/cub with a den, a leveret with a burrow, and so on. We cannot perceive a baby outside the nest – to an untrained eye, such a baby is homeless, and hence a need to rescue them is felt. What many people fail to realize is that many species birth in the open or in the feeble protection of grass. Parents also need to feed themselves while nursing the young and while they rarely leave new-born babies unattended, they may leave the young unaccompanied for several hours once they are slightly older. It is easy to assume that unattended babies may be in peril and need attention, but they have evolved in a way that keeps them camouflaged and protected in the surrounding environment. If uncertain, they may be observed from a distance to ensure that the mother returns and cares for the young. Unless the baby has been handled and cared for by someone else, it is often easy to distinguish a ‘true orphan’ from one that has accidentally been separated. Depending upon the time elapsed since the separation from its parents, true orphans are often dehydrated, weak and in weakened body conditions. They may often even be fearful or edgy, perhaps as a result of anxiety (due to being left alone for a prolonged period of time) or due to savage attempts by predators. Often, they may have been calling out for their mother for several hours and you will find that their call is noticeably fatigued, i.e., the call will start fairly energetically and then just drop with a sudden lack of energy, or be on a lower pitch than it normally would be. Animal babies that have been separated by accident will normally be well hydrated and arrive in good and clean body condition. They will be alert and responsive and also be very clean owing to the constant attention and grooming they have received. Unless the babies have been cared for by a trained or experienced rehabilitator, they may or may not be well fed/hydrated and might even have stained fur/feathers – as if food had fallen on the body and has been wiped off in patches, often closer to the mouth and chest. Although most beginners may try and feed the babies, they are unlikely to have given the young adequate care before calling in for professional help. Another danger of having being fed by untrained hands is that they might have unknowingly either force-fed or fed the wrong food to the babies and such babies will often be very reluctant to feed and usually take a couple of days longer to settle down. Such babies must also be observed for any signs/symptoms of aspiration pneumonia and treated for the same at the first observation of such signs. The very first priority in attending to orphaned babies is to address dehydration, if any. The next step is a complete health check and the treatment of any injuries, fractures, infections or diseases. The next priority is to attempt to reunite the baby with its parents, but this may only be pursued if the baby is in good health. Where possible, an attempt at reunion may even be made in a couple of days once the baby has been stabilized. Should the baby require prolonged medical attention, it must stay at the care facility for longer. For animals that don’t build a nest, the timeframe to reunite is minimal, may be a few hours to a day. For animals that nest or den in stationary locations, attempts at reunion may be pursued even after a few days and has been done successfully many a times with various species. All others will be required to stay on for hand-raising, rehabilitation and subsequent release at the appropriate age and time. Naked and immobile [in most species except for deer, megaherbivores, etc. that are born furred and fairly mobile] and completely dependent on the parent/s for care, e.g., feeding, grooming, stimulation, warmth, protection. They will be completely dependent on the caregiver to fulfill their basic needs. These young babies need to be fed at brief intervals and monitored constantly. As thermoregulation is poorly developed, they may require external heat all through the day in most environmental conditions. They will also be very tiny and delicate and require extremely tender handling. Another most important factor in handling babies is hygiene and sterilization as they are very susceptible to pathogens. Fairly mobile but still completely dependent on the parent for food, care and protection. They must be fed at regular intervals and will require external heat and some amount of grooming. They should no longer require ano-genital stimulation at this age and will have begun grooming themselves as well. Thermoregulation will have developed by now and external heat can be either reduced or discontinued, though they must be given sufficient amounts of warm bedding. The weaning process will begin by the end of this stage and completed by the time the young crosses infancy. Infants will start becoming aware of their surroundings by this age as also recognize things distinctly. They will be curious, active and playful by this stage. Mobile and fairly independent but rely on the parents for provision of food, protection and learning of behaviors, esp. foraging and hunting behavior. They may require minimal contact but enhanced rehabilitation efforts. They must be prepared for the next important stage in their life – release. Chicks that have just hatched. Hatchlings of altricial (born naked and immobile) species are completely dependent on the parents for care and will require similar amounts of care as does a neonate mammal with the exception that baby birds need to be fed in higher frequencies. Where hatchlings of precocial birds (born feathered and mobile) will require little external heat and hand-feeding – as they will mostly peck at foods on their own, they require just as much care in terms of feeding and supervision. Chicks that have acquired all their flight feathers and are about to or have just fledged. Although capable of short bursts of flight, their fight is directionless and they are still completely dependent on the parents for food, learning and guidance. Most chicks will have to be fed for a few days/weeks after fledging until they begin eating on their own. Although hatchlings and fledglings of precocial birds are mobile and can feed on their own, they require just as much parental supervision and care in terms of protection and learning behavior. Like young mammals, they are mobile and a step closer to becoming independent. Human contact must be ceased, rehabilitation efforts must be enhanced and they must be prepared or release. Although baby reptiles may be classified as hatchlings and juveniles, there would be little difference in terms of the care they require. Reptiles, at all ages, are independent of parental care and supervision. They may simply be given the appropriate environmental conditions and choice of food and they should be able to take care of themselves. They must be monitored for good health and released appropriately at the earliest possible. Often people may find entire nests with babies that have fallen due to heavy winds or storms. The parents may well be close to the babies but unable to bring them to safety. The most appropriate action in such an instance is to build a substitute nest using a shoebox, bowls, earthen pots, baskets, etc. and attach it to the original (or closest to the original) location using rope, wires, poles, etc. The nest must be sheltered from the elements and kept safe from predators. The babies must be kept warm in the meanwhile but you must avoid feeding them if you can reunite them shortly. Unless the babies are severely dehydrated, in hypothermic shock, or have visible injuries that require medical intervention, they must be placed back in the nest at the earliest. Animal babies are always nestled close to each other or cling to the parents. This not only gives them added warmth but also additional security. Unless considered detrimental for any specific reason, the young must always be housed in groups. The added benefits of housing the young together include appropriate imprinting, learning of social behavior and communication, playing, etc. Wherever possible and with species that may either mutually benefit each other or have no effect on the other species, animals may be housed nearby. This may often have to be done due to a lack of space and sharing of rehab enclosures by relevant species during rehab is perfectly acceptable and may even be beneficial in helping social interactions. Although most animal surrogates are often from a different species altogether, including us, it is always beneficial to try and obtain within-species or close-species surrogates. Refrain from fostering prey specie by predatory species as it will result in inappropriate imprinting and lack of fear of predators, thereby lower survival success after release. When housing different species together, the more impressionable species will imitate the behavior of the more dominant one or the one with greater number of individuals. This may be questionable depending upon the species in question and possibly damaging to the rehabilitation efforts if encouraged beyond a certain stage. If any animal baby is carrying or is suspected to carry any infections pathogens, which may or may not have manifested in disease, they must be isolated and treated at the very earliest. They must never be housed with or near other healthy animals or you would risk their health as well. The adage ‘survival of the fittest’ is most commonly associated with nature. This not only applies to adult animals within an ecosystem but also baby animals in it. The young of many species are known to predate on smaller and weaker animals to fulfill their nutritional needs. Barn owls are an extremely interesting example of the same. Although all species haven’t been studied to the extent of barn owls, all carnivores/predatory animals have the potential to eat up the younger siblings during spells of food shortages. They must be adequately fed at regular intervals to prevent such incidents. If there is a considerable difference in the size of the individuals within the same litter, they must be housed separately to prevent the occurrence of any incidents. In most cases in nature, the mother (or both parents in the case of birds and some mammals) not only provides the young with nourishment but also protection and security. Most species being solitary by nature, socialization is restricted to members within the family unit – the parents and siblings. The purpose of sociality is to learn and develop important behaviors that are essential for the survival of the individual. Where an individual will grow into a solitary adult, the purpose of sociality in infancy is not for companionship or to accrue communal benefits but primarily as a form of learning. It is only in gregarious species that an infant will socialize with many others outside its family unit but within the same species and may even be cared for by several individuals of that family or group. Yet, nursing is principally restricted to the primary care giver, the mother. When in danger or threatened, the youngster’s first source of protection is the mother (or its parents, where both sexes are involved in the care and upbringing of an infant). Our earnest efforts must mimic these patterns. The handling of the young must be restricted to one, or at the maximum two, caregivers. While most organizations prefer handling by two keepers/ rehabilitators as it retains flexibility, hand-raising is always restricted to one person alone. If at all handling must be switched, it must be done gradually over a few days while allowing the animal to familiarize itself with the new handler before actual contact begins. Even in nature, young animals are normally not exposed to too many outsiders and are naturally vary and extremely uneasy in even the presence of other individual. If not allowed to withdraw and/or refuse their feed, they may become extremely stressed by another person’s handling and touch. What often makes matters worse is that the new person might resort to force feeding which may not only result in physical problems but a complete emotional breakdown of the animal as well. This is especially true for species that are lower down the food chain, i.e., likely to fall prey, especially, more sensitive species like deer and birds in general. Another adverse effect of constant and repeated exposure to humans is habituation, and most likely dependency. 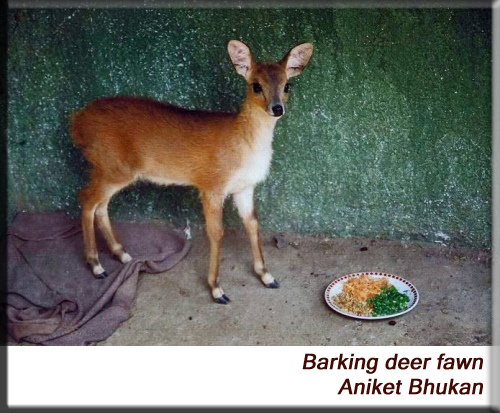 Such animals cease to fear human beings and may actively seek humans in times of distress and resort to begging. This will resort to conflict in most instances and in turn, threaten the survival of the animal. Please refer to our pages on Care, Hand-raising and Examples of Feeders for more information.